My favorite shop in the area. Customer service peeps are fantastic. The space is great, even during peak hours it's a positive experience. Way too many creeps outside eye-**** customers and taco-buyers..but you can't pick your neighbors. I'd be there spending more $$ this instant BUT their top shelf is always out, and the spendier stuff is stocked conservatively enough that I cannot get my medically useful strains on a reliable basis-- regardless of expense. I find if they are out of top shelf, it is not worth the effort due to the lower quality stock that seemingly sits on the shelf and loses potency. Most of the shops in this area are 1000x worse--ive pulled stock from two years ago from others companies-amber, dulled trichomes on the flower tasting of dirt. I spend money on my flower for a reason--I don't want a bargain on historical herb. East Olympia is the best location between the two, but give them both a visit. They stock Artizen, and when I can actually buy it, it seems to be the best quality weed i've had here in the Olympia area for the price. They are my go to dispensary. Great atmosphere and staff! Highly recommend! My friend bought flower Obama Cush on the recommendation of the sales person. So I trusted his word, bought 1/2 oz. For $40. I got home ready to relax and smoke, it tasted of dirt, no marijuana flavor, it was really awful AND it did nothing to .. Nothing at all. Not to mention...again, how awful it tasted. The next day I went back to the dispensary and spoke to the Manager.. I wasn't rude, but did say the Obama Cush tasted terrible & did nothing whatsoever. I asked him to compensate me with a simple shelf preroll..he flat out refused, extremely rude, no customer service skills at all! It was insulting, and bad for business to treat customers like that. I wask thst this man be RETRAINED in customer service skills or demoted to stock boy. Or.. Green Lady can do the right thing and respect a regular paying customer by reimbursement. While I really like Green Lady I had an unpleasant experience awhile back where shawna cursed at me while I was trying to exit the parking lot and she was trying to go into it. Other than that Iv never had a bad experience there and love the variety they keep in stock. Sondra and Eric are awesome! They make excellent recommendations and are so nice. Clean, great selection, amazing staff, and the largest selection in paraphernalia I have seen in any dispensary! Between their selections and amazing staff, you will never leave dissatisfied. So much for your updated menu.Had a list I had made from info off your menu.Of the 8 items advertised your"budtender" couldn't find but one that turned out to be overpriced and underquality.Such a waste of time.It was like looking for a needle in a hastack.Can't see the labels of any of the products that denote Strain or test results.Really disappointed.Will not return or recommend. Layla and Maggie helped me find the strain I was looking for quickly. They were both super sweet! This location is bomb- I love the cafe addition. They also carry my favorite grower, Raven Grass! Thank you Glynn for the sweet review. We are happy to hear you had a great time at our location with Maggie and Layla. Hope to see again. Hello my name is Kelly dinkers. I came into your store earlier today with my husband bob looking for something to help with my muscle aches. I was speaking to tammy at the cbd section about what Ive been using when a older gentlemen came over from your pot department inserting himself into our talk extremely rudely! He was extremely pushy about a product that I had already tried and had a bad reaction to. He informed my husbands and I it was a friends company and if that is how you train your employees to sell products that is a terrible way to do business. Tammy however was a sweetie, she handled herself like a lady and was very helpful and knowledgeable. Thank you tammy! I am extremely sorry about your interaction with the older gentlemen from our store. I am happy to hear Tammrie handled the situation with grace though. We will take care of this and see it does not happen again. I hope we can give you 5 star service for your next visit. Thank you for the the review Kelly, all feedback is welcome and appreciated. 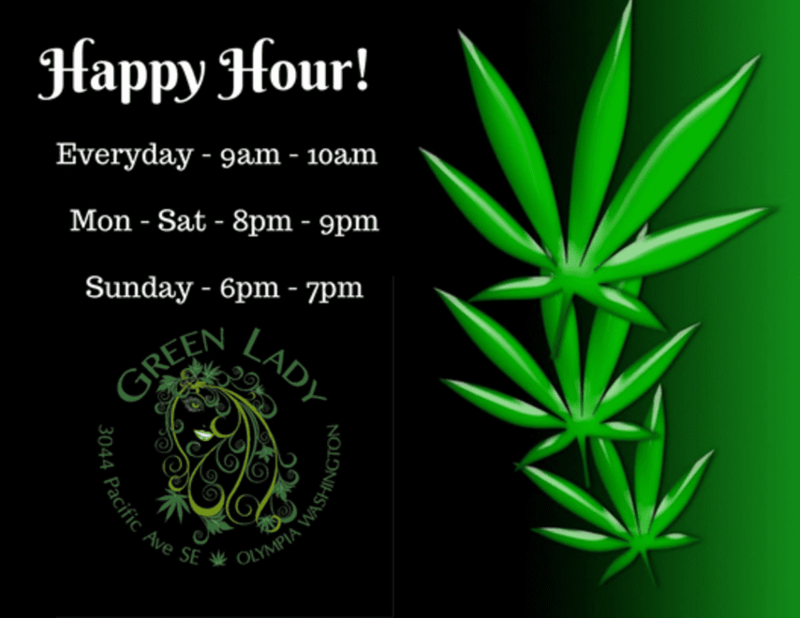 We’ve been looking for a ‘go-to’ spot in the area for a while, and think we found it at Green Lady. The CBD coffee shop next door is cool and took the time to walk us through a bunch of options. The rec shop wasn’t super busy when we got there, so plenty of time to talk through strains with the bud tenders. It’s probably the only place I’ll shop in the near future. Much appreciation :) Feel free to come in and spend as much time with us as needed.